Have you ever wondered how your fitness stacks up against professional athletes, or which sports have the fittest athletes? Well, as it turns out there are three simple fitness tests you can perform to see how you compare to the worlds leading athletes. Here are 3 of the most popular fitness tests used by sports teams to rate a athletic fitness levels. Read what each test is and how to do it then come back and find out how you compare to a professional player across sports like basketball, rugby, baseball and more. Do you remember in gym class when you had to run on the basketball court from the wall to the first line and back again then to a further line and back yet again? Well the beep test is sort of similar to that. It tests your aerobic fitness. With the beep test you run between two lines 21.87 yards (20 meters) apart at an increasing pace. It is called the beep test because you run based on having to reach the opposite marker before the beep sounds. Each minute the beep sounds will be more frequent and you will after run faster and faster as the minutes pass. What is a good score? Since the test speeds up each minute it is measured in terms of what minute (level) you reached. You would be considered an extremely fit male if you can go for 13 minutes or more. You are an extremely fit female if you go for 12 minutes or more. 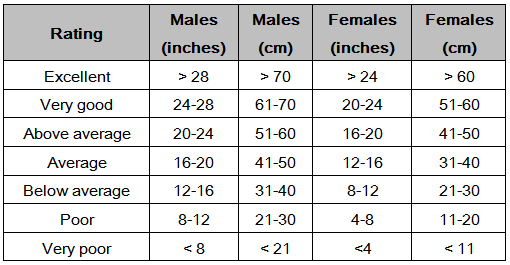 Average is 7 – 9 for men and 6 – 8 for women. What do professional athletes score? The Fiji Times reported that in 2007 Rugby Union player Kini Qereqeretabua achieved a score of 17 and 1 beep. This basically means he made it a little way through the 17th level. This is the highest confirmed beep test score ever. Basketball player Steve Nash scored a flat 17 when he was playing for the Dallas Mavericks. 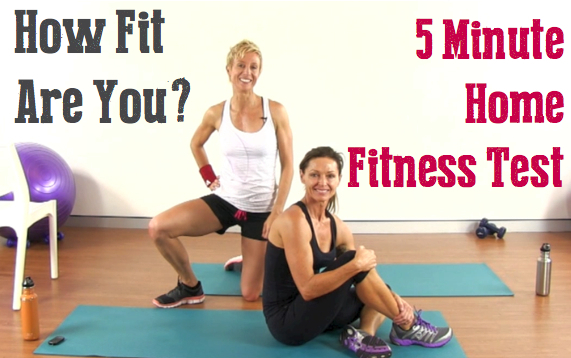 These guys are professionally fit so don’t feel bad if you can’t match them. Any score above 13 is extraordinary. To join the Royal Navy in the UK you need to do a fitness test that involves back-to-back Cooper Tests. The first in under 12:30 and the second in fewer than 10:00. That’s tough. To qualify to join the US Navy you must do what they call a Physical Readiness Test that consists of this run, curl-ups and push-ups. You pass on a points basis. The maximum points are awarded if you run the Cooper Test in under 8:15. But they still rank anything under 10 minutes as an excellent result. 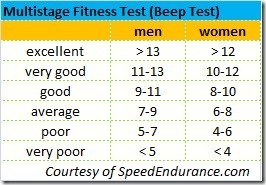 The FBI also uses this test to measure recruits fitness. They award full points for running the Cooper test under 9 minutes. How do you do the test at home? Easy. To do this test all you have to do is go to a track with a stopwatch and run 1.5-mile (2.4km) as fast as you can. That’s 6 laps on the standard 400m track. 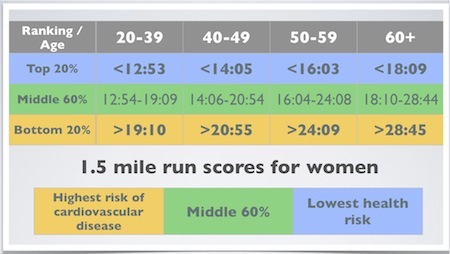 I’ve personally tried this test and getting under 10:00 if you don’t regularly run is very difficult. Running 2.5-mile (4km) fast twice weekly for 2 months I was able to squeeze in less than 10 minutes. So yeah, it takes a bit of effort and that’s why the military uses it. However, just note that the men’s world record for the 3km (1.86-miles) is 7:21. What do some professional athletes complete the Cooper Test in? There isn’t much information on professional athletes running the Cooper Test, and if they do the clubs don’t typically release their times. What I could find was Australian Football League players running a 2km time trial in pre-season training with the best results under 6 minutes. How would you like to know your leg strength with one easy test? Well look no further than the vertical jump test. All that you need to do for this gravity defying test against nature at home is stand next to a wall with your arms stretched above your head. Hold a piece of chalk and mark a spot at the highest point that you can reach with your feet still firmly on the ground. Then jump as high as you can and measure the difference between to calculate your vertical leap. Most sports fans would think the best results from the vertical leap tests are from pro basketball and volleyball players. But it’s actually NFL players due to their enormous leg strength. Let’s look at the NBA results first. Every year the NBA holds a pre-draft fitness testing the best college stars athletic ability. Over the past 20 years the best results have been less than 40 inches but more than 35 inches. Looking at the NFL pre-draft results almost every year the best is more than 40 inches but less than 45 inches. Surprising hey? It is said that Michael Jordan had a 48 inch vertical for comparison. No wonder they called him Air Jordan! If you would like to quickly improve your maximum height in a vertical jump using your arms and legs efficiently prior to take off has been shown to significantly increase results. A quick bend of the knees which lowers the center of gravity has been shown to improve jump height by 12% compared to jumping with straightened legs. Furthermore, jump height can be increased another 10% by swinging your arms during the take off phase. So what are you waiting for? Go and do the beep test. You can either download a free app for your phone or buy the audio recording online at Amazon or from iTunes. Then you just need to measure markers 21.87 yards (20 meters) apart and go at it. How do you compare? Then try the Cooper Test and Vertical Jump Test. Professionals are pro for a reason. They are remarkably fit. But it is always nice to compare yourself against the best when it comes to raw fitness ability. Note: This is a guest post by Sean Donnelly, a health and fitness fanatic. When he’s not crafting the next dish in the kitchen, he spends his free time writing about food and health at listfitness.com, brewing espresso in his favorite semi automatic machine and tweeting at @List_Fitness.Want to submit a guest post? Read HealthResource4u guest submission guidelines.